Frontier Communications has existed under one name or another for nearly a century, beginning as a public utilities company. Frontier now specializes in providing residential TV, internet, and phone service chiefly in rural and suburban areas. Its business services include satellite TV, internet, phone, texting, data networks, device protection, online security, WiFi, and managed VPNs. Frontier Communications has a colorful history. It begins with Wilbur Burton Foshay. In 1916, he invested a $6000 loan in financial and real estate interests. It was mainly in public utilities, though that he made his reputation, aggressively buying one utility company after another throughout the Roaring Twenties, and financing his acquisitions with sales of stocks. After the stock market crash of 1929, his business empire was found to be hollow, his profits existing only on paper. It was a massive kiting scheme, kept afloat only by continuous sales of stock. The company was forced into federal receivership, and Foshay was convicted on three counts of mail fraud. In 1935, the remnants of Foshay’s company, called the Public Utilities Consolidated Corporation, were reorganized and incorporated as the Citizen’s Utilities Company. It survived the Great Depression, but it didn’t prosper. In 1946, the company attracted the attention of Richard Laurence Rosenthal, a young Wall Street financier. Rosenthal was different from others on Wall Street, conducting his own research on acquisition candidates instead of relying on official company sources. This impressed Wall Street friends, who asked him to head an investment group. He agreed, and decided to concentrate on industries for which sound management would make a big difference. Speaking about this to Barron’s magazine in 1980, he said that his research had taught him that utilities were a good place to find poor management. After leading the buyout of Citizen’s in 1946, Rosenthal became its chairman and president. He often resisted regulators strenuously, believing that they didn’t understand utilities and that they inhibited good customer service, and he extended the company’s operations into several states, so the business would not depend on the whims of any single state’s regulators. His strategy paid off. The Citizen’s Utility Company produced record profits every single year he was at the helm. Under new management in the 1990s following Rosenthal’s retirement, Citizen’s used its utility rights of way for aggressive expansion of its telecommunications business. It bought access lines in nine states from GTE, and access lines in six states from Alltel. With the Telecommunications Act of 1996, new markets across the country became available, and Citizen’s embarked on another round of aggressive acquisitions. Before long, telecommunications were producing two thirds of the company’s revenue, and its telecom assets were renamed Citizen’s Communications, while its energy and water operations were named Citizen’s Public Services. By June of 2000, the company’s management began divesting the water and energy assets. 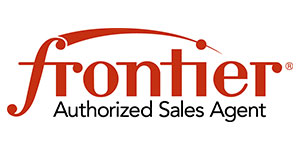 With the purchase of the Frontier Corporation in 2005, Citizen’s added one million access lines, and it adopted the widely-recognized Frontier brand. In an agreement with Dish Network, Frontier Communications began providing satellite TV along with its phone and internet services, enabling its customers to bundle all three services in a single bill. Frontier Communications serves mainly rural and suburban areas. The residential services it offers include Dish Network satellite TV, broadband internet, and phone. Its business services include Dish Network TV, internet, phone, texting, data networks, device protection and online security, Wi-Fi, and managed VPNs. Advantages of Frontier Communications: Frontier serves many rural areas that previously were unable to obtain high-speed internet service. Its basic internet service level, at just $19.99 per month, costs less than most competing internet services. Disadvantages of Frontier Communications: Many Frontier internet customers report download speeds lower than what they were promised, and customer service has sometimes been erratic. We recommend asking neighbors about their experiences with Frontier. In some cases, satellite internet will be a better option.